Make the birthday girl's celebration sparkle with these playful Dora The Explorer Dessert Plates. 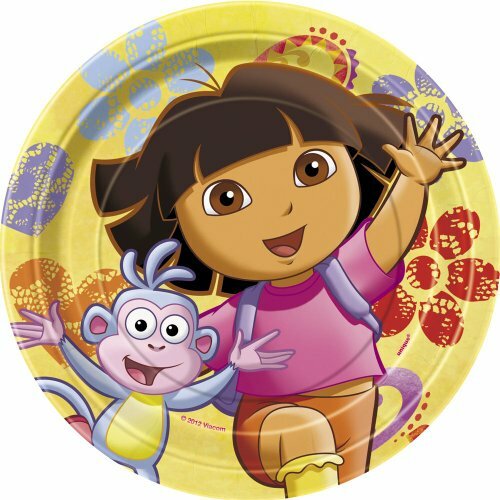 These vibrant cake plates featuring popular characters Dora and Boots are wonderful for serving pizza, sandwiches, cake, snacks and more at a Dora The Explorer Party. Dora The Explorer Paper Plates measure 6.875"
American Greetings Strawberry Shortcake Plastic Table Cover, 54 x 96"
Disney Tinkerbell Plastic Printed Table Cover Birthday Party Tableware Decoration (1 Piece), Purple/Blue, 54" x 96".